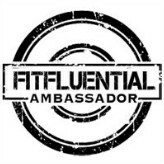 Thanks to FitApproach and Vega, I had the chance to try all of Vega’s new Food Bars being launched next month! They provided me with free product in exchange for a review and some tweets/instagrams but all opinions are my own. 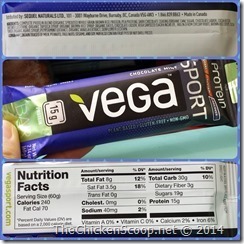 Anyway, since I already love Vega’s protein powders and shakes, I jumped at the change to try their bars even though I don’t usually eat these types of foods (I’m more of a whole foods person). I was super excited when I get this mega-pack in the mail! I quickly got started, and I’ve never eaten so many bars in such a short amount of time. I stuffed them all in my lunch box to make sure I would have them handy. 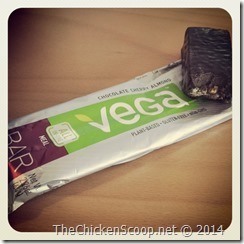 First, I tried the Vega One Bar which is basically supposed to be a meal replacement bar. This was probably my least favorite bar because of the chalky texture but I didn’t hate it. It was was just last out of 4. It had some crunchy nuts in it which added a nice texture contrast to the protein paste. It had the taste of a candy bar with nuts. If this is something you are looking for, I would say it’s a good choice! I never had another brand I could tolerate. 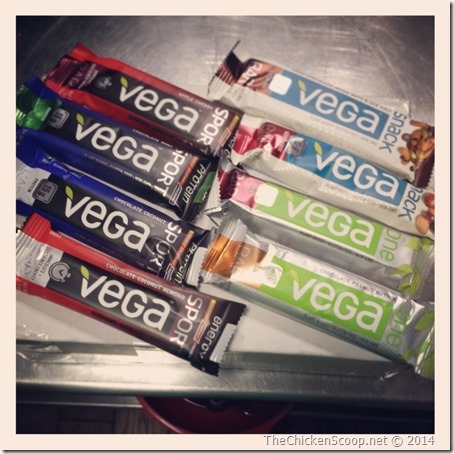 Third, I tried the Vega Sport Energy Bar which took me by surprise. I guess I was expecting a protein type bar (even though they have the specific protein bar), but it was basically a fruit paste bar with nuts. Think if you purreed figs and almonds together and made a bar. It was SO GOOD and just what I needed to hold me over through a little round of tennis with the hubs. It was the perfect pre-workout snack! 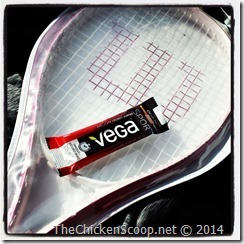 Finally, I tried the Vega Sport Protein Bar and was very pleasantly surprised. I have never met a protein bar I liked until now! The Chocolate Coconut was okay but the Chocolate Mint was delicious! It was like a healthy York Peppermint Patty in protein bar form. So good! I don’t eat bars because I never found ones I liked until now. I knew Vega wouldn’t disappoint! So basically, I am so glad I signed up for this review! I’m not a “bar eater” at all but I think I could add some of these to my regular rotation. Even the protein ones! So definitely check out Vega Bars when you get a chance!! 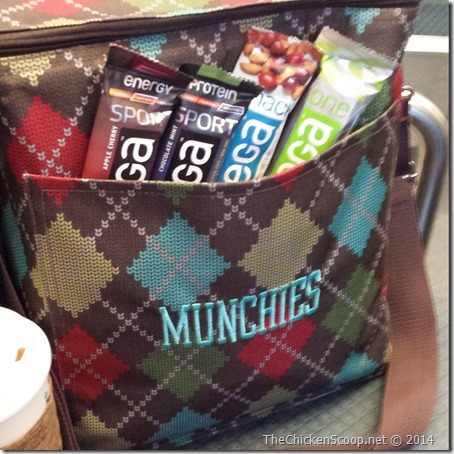 What is your favorite type of bar for a quick meal/snack? 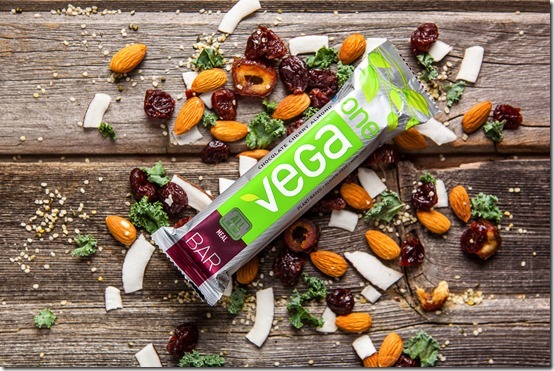 I’m a trail mix bar type person (like theVega Snack Bar). 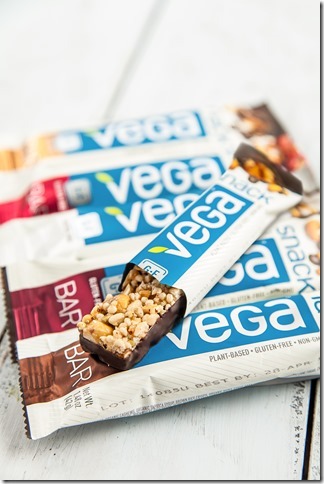 I never used protein bars in the past but could be convinced to use the Vega Chocolate Mint Protein Bars! I agree! I actually kind of liked having bars regularly in place of some meals/snacks. It was just… easy? So glad you like them! I have had to resort to a protein bar while at work. I only have about 5-7 minutes to chomp something down while at work from 8-1 (before going back to work I’d eat 3 times during that time!!!) So after I put my kids on the bus at 11:45 I grab a Quest bar. 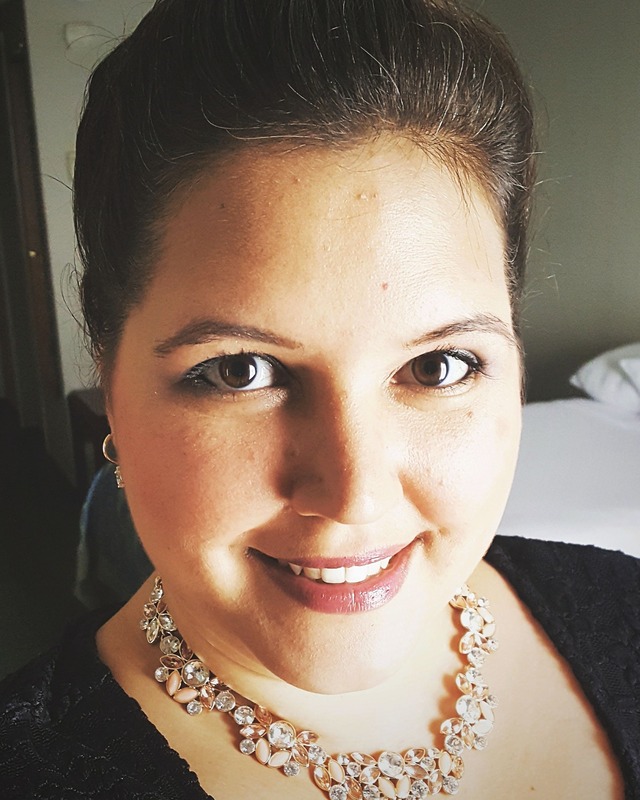 There are only 3 flavors I can tolerate which have no artificial sweeteners – they do have a little stevia, and they are great to keep in the car for emergencies while running around for soccer on the weekends. I’ll have to keep the Vega ones in mind, too! Thanks for a great review! I saw Quest bars at the store today so I picked up the lemon one to try it out!